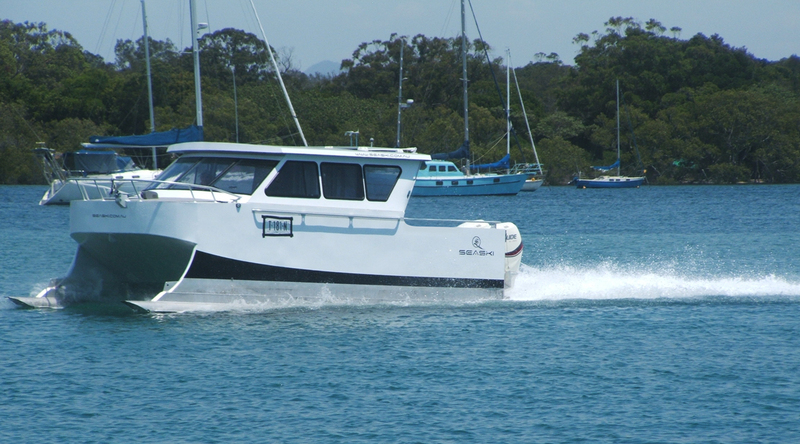 A new small boat design technology from Australia has racked up a series of world firsts for its development company located in the Gold Coast region. The design has introduced a significant change in hull design options for small vessel owners. This change heralds higher speed capabilities in rougher sea conditions than most boats can cope with. The unique boat utilises special skis when underway to raise the hull above the water surface giving it similar properties to the hydrofoil concept, but with much higher speed potential and lower costs. A $96,000 Federal Government dollar-matching grant helped the technology owner, Sea Ski Australasia Ltd, to realise on it’s 10- year program to develop the concept to where it is now ready for marketing. * It allows a family-style cruiser, or recreational fishing rig, to achieve speeds equivalent to very high efficiency sports vessels, such as the Scarab brand, using the same power sources. * The skis allow the design to maintain cruise speeds in seas and heavy chop conditions that force other designs to slow considerably or face damage, which the builders claim to be a potential life saver. * At cruise speeds, in the 70 km/h range, the vessel generates a hardly perceptible wake or bow wave, which is a problem of considerable concern to waterway authorities the world over. (The US Coast Guard’s Recreational Boating Statistics 2012, reported 633 accidents in the USA due to force of wave/wake, hazardous waters and weather of which 14% cost 106 lives). * The boat can be configured to have its fuel load outside the hull, within the special ski housings, eliminating fire or explosion within the hull confines due to leakages or spills. * At cruise speed, the design draws as little as 100mm of draught in its ski paths, making it an environmental asset in waters where concerns exists for boat strikes on amphibian life and damage to sea grasses such as surrounding marine parks. * When not underway, or at slow speeds, the skis impart stability to the boat, considerably reducing the vertical forces and rolling experienced by other designs that induce seasickness and cause injury, or man overboard events. * The vessel can be exported in a flat format that is shipping efficient and/or allow destination clients to add their own superstructures to an exceptionally strong foundation that provides all the inherent advantages of the design. The vessel is considered ideal for roles in rescue, coastal surveillance, tourism, servicing off-shore installations, recreational pursuits and water taxi services. It has been designed to survey standards for commercial operation and the first production prototype is having its news media introduction today (June 15, 2015) at Fingal boat ramp on the Tweed River. A major success for the company was discovering that local aluminum producer, Ullrich Aluminium, was able to extrude the special skis in Australia, which the builder was expecting to out source to China, where concerns exist regarding the marine grades of aluminium produced. Sea Ski wants to ensure its boats are of extremely enduring strength, capable of decades of service without mishap, and is dedicated to using the finest of Australian resources, including our world-best aluminium, to ensure this outcome. The company does recognise, though, that it will be competing against inexpensive Asian manufacturers for Asian markets, so its plans include exporting seaski vessels in a robust foundation platform comprising the skis, hull and deck to the waterline, that overseas’ builders can then add any superstructure configuration to. This way the company intends to protect its integrity for a “best of build” base product that users can identify as providing lasting service and safety owing to weld and metal strength integrity and positive buoyancy flotation. For further information please contact: Trevor Payne, 044 7275703. trevor@seaski.com.au.